Bumblebees can sting, at least the queens and workers can, and their sting is not barbed like that of the honeybee, so they can sting more than once. The photographs above anf below show the sting of a Bombus lapidarius queen taken from different angles. I found her dead in the garden one morning. It was early in the season so she may have been fighting over a nest site with another queen, or she may just have died in the cold of the night. Normally the sting remains hidden inside the last abdominal segment when not being used. The reason a honey bee dies after she has stung a human is that the barbs in her sting and our relatively elastic skin prevent her pulling the sting out. Eventually she will either be swatted to death by whomever she has stung, or she will pull so much that the sting, poison sac and part of her abdominal contents will be pulled out of her body and left hanging from the stuck sting, and she will fly off to die. If the sting and poison sac are left behind hanging out of your skin the muscles will probably still be attached to the poison sac and will still pump poison for a while, so you should pull the sting out. Some say it is best to pull, other say you should use a downwards brushing or scraping motion. The sting of the bumblebee and other bees evolved from the ovipositor, that is the tube that many female insects have that the eggs passes down and they use to position the egg in a suitable place. It is believed that the sting evolved to be used against other insects - who do not have elastic skin - so the sting could easily be pulled out. It is only relatively recently that mammals have become bee predators, so the honey bee sting will probably evolve to have smaller, then no barbs. However this does not explain the smooth bumblebee sting, and bumblebees are usually thought as less "advanced" than honey bees. Also it is not the survival of the individual worker that is important in a hive or nest, but the survival of the new queens and males, as only they will go on to breed. What does a bumblebee sting feel like? I have never been stung by a bumblebee, but I have heard that a bumblebee sting is less painful than a wasp sting, some say it is also less painful than a honey bee sting, others that it is more painful. Also the pain seems to be worse in certain parts of the body - the face and neck for instance. And others complain of the swelling and irritation lasting for days after the initial pain of the sting has worn off. Bumblebees are reluctant to sting, and appear to do so only if they are mishandled or their nest is threatened. However I have heard recently that some species of bumblebees found in America (north and south) are more aggressive than European species. So always treat bumblebees with respect as there are some people who have an allergy to bee venom that can lead to death even after just a single sting if not treated promptly. I am often asked if a sting can regrow. The answer is no. I imagine if it is just the sting itself that has broken off the bumblebee would manage to lead a normal life, as most bumblebees will go through life never having to use their sting anyway. Male bumblebees cannot sting as they do not have a sting. 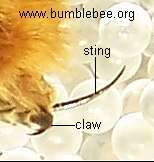 In males the part of the body that becomes the sting in females becomes the genital capsule (see the photograph below) in males, so is used in mating. 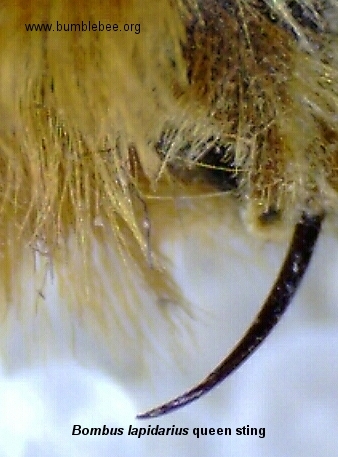 The structure of the genital capsule of each species differs slightly, and can be used in identifying dead bumblebees. Normally the genital capsule, like the sting, is hidden inside the abdomen when not in use.